Durable Black Vinyl Cover for Fire Pit and Surround. 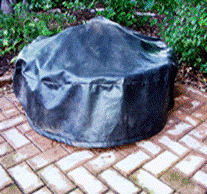 64" Diameter Covers 60" diameter enclosure. Protects firepit from weather and debris. Pull string at the bottom keeps it on your enclosure.